Now that's my kind of Santa. 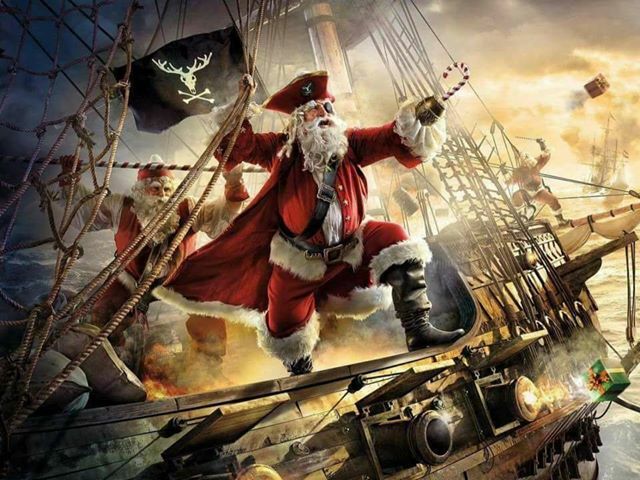 Instead of cannons, he shoots out presents! This picture brought a chuckle to me on this "1/2 way there" day. The antler cross-bones flag is hilarious, and the candy-cane hook???? Still laughing at that one. What a wonderful Mary (as in you, ma'am) Merry Christmas!! Dear MaryLu, this more than likely does not belong on this post, but I am being prompting to post it. At 10:11 am --I was playing a game of Scrabble with my daughter-in-law and the words to the Lords Prayer entered my mind-- with cool breathe within my mouth ( I know that sounds silly-- but when I am deep in prayer it is that way-and it is strange but I feel God's closeness in times like that) so I started singing softly the words amid the tender tears and then some of the words --God you are so beautiful-- and I knew at this time that I needed to pray -for who I do not know-- ( this has happened to me many times--) I prayed until I felt it was ok to stop. This happened over a half hour and I am still in that peaceful knowledge that I just spent some time in the presence of my Father. I am still feeling that awesomeness. So much that when I stopped praying I knew I had to share this and each time -you came to my mind. I believe in my heart that someone who reads this -who might be afraid to be obedient-- that when the Holy Spirit comes and gives you a task to do-- embrace it --be obedient- and if you don't know what to pray-- just pray--- and be thankful that our Father has just embraced you. Thank you for letting me post this. To fully be in His presence here on Earth and feel this much love-- how much more will we feel --when we are face to face in His Kingdom. Nope. It doesn't sound silly. It sounds like something the Lord would do. Thank you for being obedient both in your prayers and in posting this here. If the message is for me, I told the Lord, I'm open to whatever He wants me to do. Here I am, Lord, send me! If it's for someone else, I know the Lord will bring them here to read and be blessed. What you wrote just gave me goosebumps! I rarely read the comments on anyone's blog but I just felt led to and I have no doubt you were one of the prayer warriors I asked God to raise up this morning over my sister. We are in battle for her life (she is severely depressed) and have had extra spiritual warfare going on today. Thank you for your obedience!. And yes,to anyone else reading this I agree wholeheartedly be obedient to the Spirits prompts and when you don't know what to pray just pray. Dear Lori, Lori Benton??? Thank you for telling me about your sister . Know that my prayers will be going out for her. In reading your post just now- I feel tears forming and I will be one of your prayer warriors. Elsie, see how the Lord works? That's awesome. I'm glad you and Lori connected. Lori is a friend of mine.. (Not Benton) whose book I read recently. Losing Lance is the title. She's been through a lot. Thank you for praying for her and her sister. I'm doing the same. God Bless you both! Thank you both Elsie and MaryLu! As I promised yesterday to be one of your prayer warriors, I am doing just that! God is awesome! Blessings to you and your loved ones. MaryLu, my prayers and Blessings to you and yours! Merry Christmas!! !